Garland's GI-SH/GR 3500 2081 countertop commercial induction cooktop is made with a durable stainless steel exterior that is easy to clean. 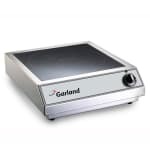 It has equal heat distribution all around, with consistent results across the entire cooking surface. A rotary dial thermostat control with LED read out is also included. *The warranty will not be honored for residential or non-commercial use of any Commercial Equipment.